MFI’s Bayna Hasim (left) and April Melivo (right) poses with Kristine Wagan during the recognition ceremonies of Palawan State University’s Graduating Class of 2016. 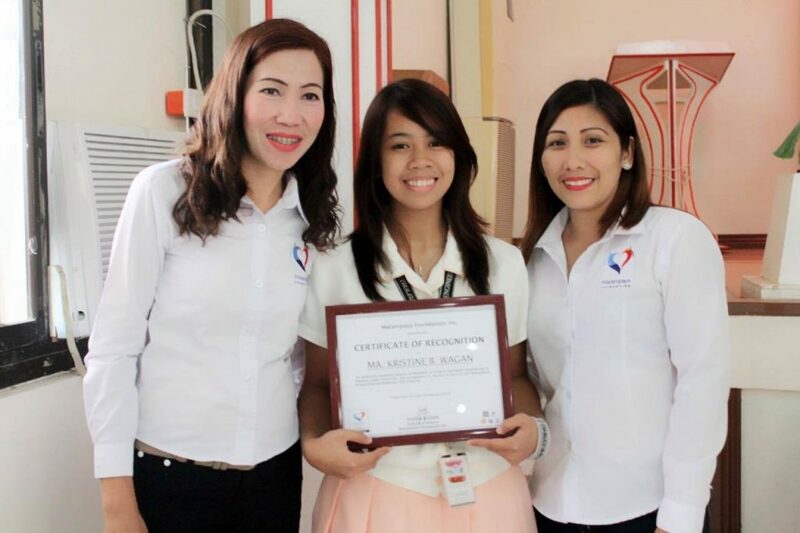 Twenty-year old scholar Kristine Wagan became the first Petroleum Engineering graduate of Malampaya Foundation, Inc.’s (MFI) Sustainable Development Scholarship programme at Palawan State University on April 6. Wagan, the youngest of five kids and daughter to a jeepney operator and a housewife, was a beneficiary of a City Scholarship in the first three years of her undergraduate degree, and an MFI scholarship in her final two years. “Nabuhay po talaga ako sa college dahil sa scholarships (I survived college because of scholarships),” she says with gratitude for the generosity she has benefitted from. 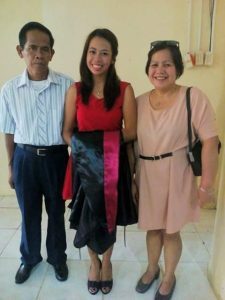 Kristine Wagan, first Petroleum Engineering graduate of the Malampaya Foundation, Inc. scholarship programme, stands with her proud parents minutes before her graduation march. Wagan said that the scholarship not only covered her educational expenses, she also received a stipend. “Malaking tulong po yung scholarship. Feel na feel ko talaga. Nakatulong din po sa parents ko—hindi naman po kasi masyadong marami pera namin. So malaking tulong po (I really felt the impact of the scholarship. It also helped my parents. We don’t have a lot of money. So it was a really big help),” she says. 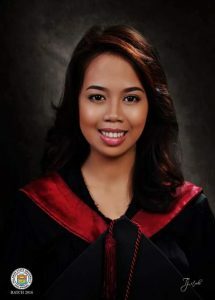 Kristine Wagan is all smiles in her graduation picture, having completed her Bachelor of Science in Petroleum Engineering at Palawan State University. MFI provided 30 scholarship awards in 2015; 20 were given to undergraduate beneficiaries and 10 went to post-graduates. 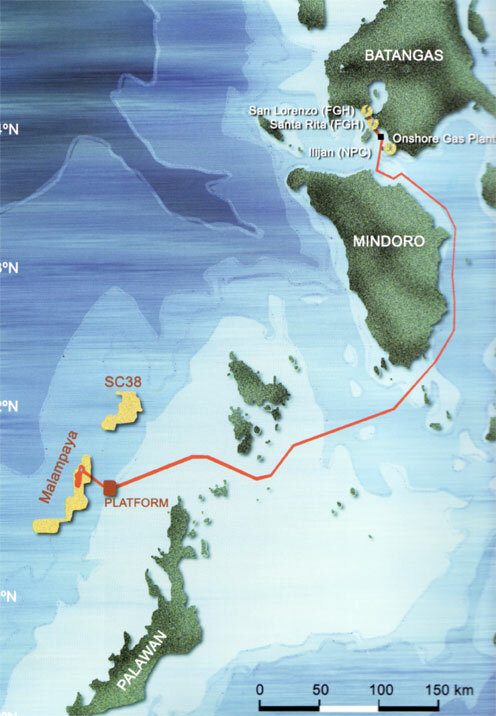 In 2014, MFI established the Malampaya Sustainable Development Scholarship in partnership with the University of the Philippines, Palawan State University, Western Philippines University, and Batangas State University. MFI recognizes the challenge and the importance of sustainable development in the Philippines. With this scholarship programme, MFI aims to contribute towards sustainable development in the provinces of Batangas, Oriental Mindoro, and Palawan. The scholarship offers full undergraduate and post-graduate courses in engineering, energy development, environmental sciences and management, and marine sciences. The scholarship programme also shoulders the educational expenses of deserving, financially-challenged students. It prepares scholars to become future professionals and specialists in energy development as well as environment and natural resources management.